Balancing on a plank of wood atop a half­-constructed second- floor patio, I looked down onto the parking lot of East Side, the German restaurant in New Britain. Nothing but a whole lot of cars in front of weathered buildings in a rather rundown-looking residential neighborhood. Although it’s impossible to confuse with Bavaria, that’s not what owner Nick Augustino has in mind. The Germany he produces is in the wiener schnitzel, the roving accordion player, and the giant mural of Old Hei­delberg. And, of course, it is in the beer. As bold as his boisterous restaurant, the gray and mustachioed Augustino is doing what many in this recession are not: after 10 years as owner, he’s still expanding his business. I had the chance on a recent late spring afternoon to learn about Augustino’s plans and to sample several authentic im­ports during a lunch that left me five pounds heavier and longing to visit the real Ger­many. East Side is probably best known outside of New Britain as that restaurant advertised on highway billboards with the slogan, “Ticki, Tocki, Ticki, Tocki, Hoy, Hoy, Hoy!” To be honest, the signs actually re­pelled instead of attracted me. I imagined a Chuck E. Cheese for grown-ups with kitschy, lederhosen-wearing staff mem­bers leading intrusive sing-a­longs. When I saw on their Web site that not only was the Ger­man beer authentic, but that there were some offerings on tap I couldn’t find in the pack­age store, I braved what I thought would be ticki tacky. Far from being a plastic replica of a Hofbrauhaus, East Side has the sense of perma­nency. The building on Dwight Street has been a restaurant for more than 70 years, and was once a grocery store, but you would never know it. Its front doors open into a pleasant foyer that leads you to either the large banquet room on the left or quieter, cozier rooms to the right for more private dining. I was part of a party of 10, and since we’d made reserva­tions, we were seated right away in the banquet room, which was nearly full. At the front of the room, in front of the gorgeous mural, was a retire­ment party. 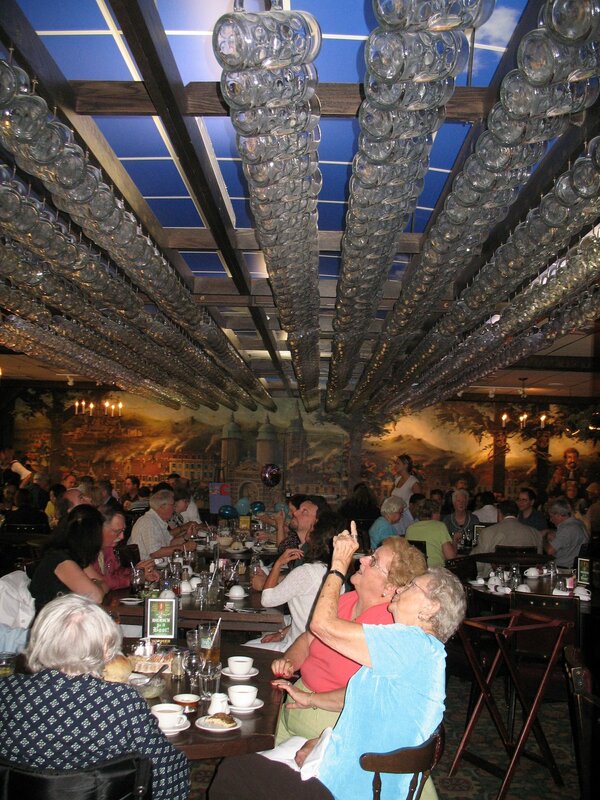 Above my head were row after row of hanging glass mugs, attached to hooks that belong to members of the restaurant’s Stein Holders As­sociation. This particular afternoon, Augustino led a few customers on a quick tour of his expansion, which he hopes to complete in July. If he took a breath any time during the tour, I couldn’t tell. With the assured patter of a born businessman, Augustino commented on every detail of the renovation. He took us, with our beers in hand, up the serv­ice passageway to the “Münich Room,” on the second floor where there used to be an apartment. It’s now painted deep red and light tan, with over-the-top flair like ornate chandeliers and what looks to be a throne on a high ledge behind an arc of beer taps. This sanctuary will feature other extras, Augustino ex­plained, like rails on the bars and tables that feature “snow” (really shaved ice) on the edges for you to keep your beer mug cold, poured from his new, $50,000 computerized tap sys­tem. Just off of the room, which will seat up to 65 people, will be a gated vault where club mem­bers’ mugs will be stored. The vault, like nearly everything else in the room, seemed to counter the democratic spirit of the banquet room with a privi­leged and private VIP room vibe. I could see it working very well, because even tipsy Germans need to get away from the pandemonium once in a while. Augustino kept his tour mov­ing, through a half-completed hallway that will serve as a kind of smoking section and out onto the sun, where the founda­tion was being laid for the beer garden. According to the plan, there will be an indoor and outdoor portion. “It’ll be four-season,” Augustino said. “The indoors will have the heat and the TVs and there’ll be a bar here with full food service.” He won’t be covering anything up, and he joked about the mix in cultures the addition will foster. “So the neighbors will hear a little Ger­man music, we’ll hear a little Spanish music. It all works,” he said. That expansion might work, but what I cared about more was the beer and food being served right now. Settling un­der a heavy table in my heavy chair, I was ready for some heavy food. The meal started out light, however. On the table were some vinegary cole slaw and creamy cottage cheese. I or­dered one of the three beer samplers, which came with tastes of four different beers each, and made two of my guests order the others. Most of the beers were light, crisp and refreshing — the Spaten Lager and Dinkelacker pilsner, while some, like the Weihenstephan and the Hacker Pschorr lager, were so light they seemed non­existent. One beer that I’d nev­er had before was the Gaffel, which is a light Kolsch-style beer, brewed in Koln. It was very light with a hint of hop in the aftertaste, but overall lighter than I prefer. In my view, a delicate beer goes with delicate food, and that was not what I ordered: I went with the Burgermeister plate ($14), which included generous por­tions of fat German bratwurst and a German sausage (which they substituted instead of knockwurst). This came with “German onion soup,” some Spatzle — which tasted like doughy elbow macaroni — and appropriately tart sauerkraut. I found that the darker beers did the trick in pairing with this food, particularly the Spaten Maibock, which was malty and citrusy, and the Spaten Optima­tor. So my fear of a EuroDisney knockoff of a beer hall was un­founded. True, master accor­dion player Walter Lawrence did play a beer-related parody of “It’s a Small World After All,” but you can’t fault a guy who’s so clearly dedicated to his craft. And the service was top notch, especially from Car­olyn, who is so modest she re­quested I not print her last name. “The atmosphere can get out of control,” she said, with a smile. “I need that.” Don’t we all, Carolyn. Don’t we all. Until next time, nippen sie gut. This column was originally published in the Waterbury (Conn.) Republican-American in June 2009. This entry was posted in Beer Snob and tagged East Side, Oktoberfest. Bookmark the permalink.